One of the graduate schools of The University of Tokyo. This is the only graduate school located in Kashiwa Campus. One of the courses of Dept. of Urban Engineering, School/Faculty of Engineering, The University of Tokyo. (The other course is Urban Planning Course.) I have taken bachelor, master and Ph. D. degrees from here. One department of School/Faculty of Engineering. One of the mother organization of APIEL and I have graduated from this department. One of the graduate shools/Faculties of The University of Tokyo. It is located in Hongo Campus. A network type research platform for establishing "sustainability sciece", which consists of 5 partner universities and several collaborating institutions. Under IR3S scheme, sustainability science education programs were established in each partner university. GPSS is one of them. 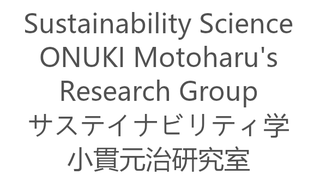 Sustainability Science Consortium (SSC) established in 2010 is the successor or IR3S.